The forest department said Monday that four of the dead lions were found to have a virus infection, while another six were infected with a protozoa. 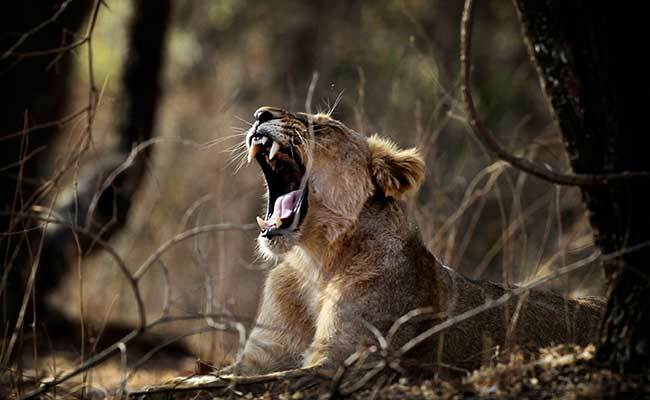 Two more lions, shifted to a rescue centre during a screening drive in Gujarat's Gir Sanctuary, died Tuesday, taking the number of lion deaths to 23 since September 12, an official said. "Two lions, rescued earlier, died today morning due to infection," said Additional Chief Secretary of the Forest Department Rajiv Kumar Gupta. Eleven lions had died in the forest due to reasons such as infighting and infections between September 12 and 19, while 10 more died between September 20 and 30 after they were shifted to a rescue centre. With the latest deaths, the number of lions that have died since September 12 has reached 23, Mr Gupta said. Chief Minister Vijay Rupani termed the deaths as "very unfortunate". "It was a very unfortunate incident. 20-22 lions inhibiting in one forest range have died due to infection. To make sure that other lions are alright, we have called in doctors from Delhi and Pune to examine them," Mr Rupani told reporters in Porbandar Tuesday. "We are also probing whether the officers who have the responsibility of that range have shown carelessness," he said. The forest department had said Monday that four of the dead lions were found to have a virus infection, while another six were infected with a Protozoa-class organism carried by ticks. All these lions lived in Sarasiya area of the Dalkhania range of Gir Sanctuary, officials said. The department launched a screening operation in the range to identify sick lions following the death of 11 lions between September 11 and 19. However, 12 sick lions, which were caught and shifted to a rescue centre, have died since then. The virus found in the carcasses of these animals has not yet been idenitifed, as per the officials.